She whizzes! She smashes! She blocks and pivots! Who, you may ask? 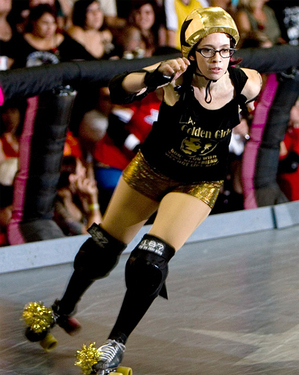 We speak of the one and only Judy Gloom, daredevil women's banked track rollerskater from the Los Angeles Derby Dolls team "Fight Crew." Though she poses by day as a mild-mannered librarian on a bicycle, Gloom never steps foot on the rink without her frames, where her Silver Lake in green cork is just what she needs for the danger she craves and her need for speed. If your attendance at women's roller derby is overdue, it's time to check back in!